Lights Out Disposal Company will hold the 1st Annual Green Weekend on Saturday, March 15th, and Sunday, March 16th, from 9 am – 2 pm at Lot-I 2400 Historic Decatur Road. The event will offer a resource where the community can REDUCE, REUSE, and RECYCLE. “Demonstrating our support for this important effort, Lights Out Disposal is pledging the first 1500 residential fluorescent lamps and first 800lbs of residential batteries to be recycled free of charge,” commented founder, Alexis Demko Woodford. Lights Out Disposal Company will hold the 1st Annual Green Weekend on Saturday, March 15th, and Sunday, March 16th, from 9 am – 2 pm at Lot-I 2400 Historic Decatur Road. The event will offer a resource where the community can REDUCE, REUSE, and RECYCLE! 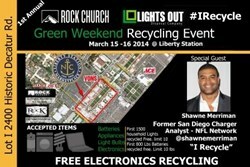 Green Weekend is an outreach event that encourages the community to bring electronics, cans, lightly used clothing, light bulbs, batteries and more to be recycled, as well as any items that can be reduced and reused out of homes to support the Rock Church Thrift Store. “Demonstrating our support for this important effort, Lights Out Disposal is pledging the first 1500 residential fluorescent lamps and first 800lbs of residential batteries to be recycled free of charge,” commented founder, Alexis Demko Woodford. After the allotment of Recycled Fluorescent Lamps and Batteries are met, these items will no longer be accepted at the event. Please note event is for Residential Recycling only, limit 10 Bulbs to recycle and 10lbs of Batteries limit per household. Attendees bringing electronics for recycling will be entered into one of eight raffles with prizes from premier San Diego companies. A Green Carpet will be rolled out for special guests, NFL star Shawne “Lights Out” Merriman, Partner – Lights Out Disposal; Congressman Scott Peters representing the 52nd District and County Supervisor Ron Roberts. The mission of the event is to unite the community through a positive recycling experience that makes a conscious effort to take care of the environment. Participants can be proud of their support and effort to be green. Lights Out Disposal certifies/pledges that all electronics recycled through the company are sent to a Certified R2 Rios Electronics Recycler.